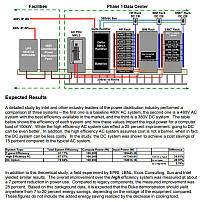 Let Chip2Grid® technology help you meet the 2005 Energy Act mandate! A consortium of researchers from the public and private sectors have embarked on a real-world experiment to gauge whether large computing facilities can operate on less power if they cut alternating current (AC) out of the equation. This project was sponsored by the California Energy Commission's Public Interest Energy Research (PIER) Industrial program with technical leadership by LBNL. 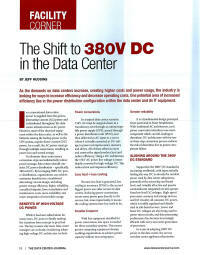 Duke Energy and EPRI Sponsored DC Powered Data Center Demonstration using 380V DC Power. Through this demonstration, it is expected that the Duke Energy data center should yield anywhere from 7 to 20 percent energy savings, depending on the vintage of the equipment compared. Direct Power Technologies, Inc announced the successful commissioning of a "first-in-world" multi generation source ZBB EnerSystem™ that provides uninterrupted power to DC voltage lighting loads, rack power to servers and other miscellaneous loads at (VISA's flagship) data center. This paper presents an overview of the case for the application of 380V DC as a vehicle for optimization and simplification of the critical electrical system in the modern data center. Specifically, this paper presents currently available architectures consistent with ANSVBICSI 002-2011 and the EMerge Alliance/Data Telecom Center Standard Version 1.0. Additional EMerge Alliance white papers will explore the specific elements including economics, reliability, safety and efficiency. As the demands on data centers increase, creating higher costs and power usage, the industry is looking for ways to increase efficiency and decrease operating costs. One potential area of increased efficiency lies in the power distribution configuration within the data center and its IT equipment. 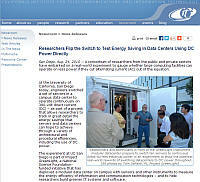 If you would like more information on licensing the Chip2Grid® technology please Contact Us. Copyright © Chip2Grid ®. All Rights Reserved.